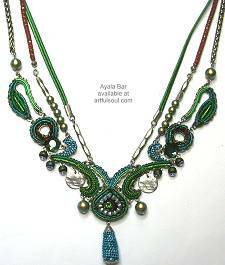 On this page we gather GREEN jewelry and handbags! So many shades to choose from here, one for every season, like summer lime, fall avocado, winter forest and spring sage! 1-3/8 inches long on goldfill earwire, 5/8 inch across. Bright turquoise green circle with darker pattern is covered by matte turquoise triangle and sparkling brass textured one. 1-5/8 inches long on sterling earwire, 5/8 inch across. Two elongated triangles overlap, the background is marbled celery greens and cutout scrolling design in hematite color metal swings above. 1-3/4 inches long on sterling earwire, 9/16 inch across. Broad leaf shapes are curved gracefully in the background, a tonal green leaf pattern on one, minty sand on the other, and shiny silver leaf charm tops it off. 1-5/8 inches long on goldfill earwire, 9/16 inch across. Brass and green leaves in graduated sizes with textural interest, gracefully curving. 1-5/8 inches long on sterling earwire, 11/16 inch across. Background metal flame shape is softly blended from aqua to lime, a cutout of spirals on top is richly emerald green. 2 inches long on sterling earwire, 7/8 inch across. 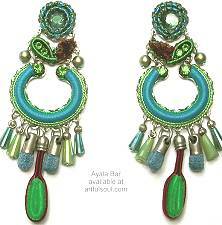 A pair of balloon-shaped cutouts are joined at top and bottom, colored in light and dark sage greens, with mint green bead dangling underneath. Rich with color of glasslike jeweler's resin, this bangle has oval shape, hardware in gold vermeil (18kt gold over sterling). Hinged for easy on-off (hinge stays under wrist), and magnets in the ends help keep it closed. Measures 2-3/8 inches across, 1-3/4 inches deep, for small to medium wrist. 1/2 inch wide and rounded top surface. The color is translucent minty green, similar to aventurine or light jade colors. Rich with color of glasslike jeweler's resin, this bangle has oval shape, hardware in gold vermeil (18kt gold over sterling). Hinged for easy on-off (hinge stays under wrist), and magnets in the ends help keep it closed. Measures 2-3/8 inches across, 1-3/4 inches deep, for small to medium wrist. 1/2 inch wide and rounded top surface. The color is translucent olive green, like a medium jade. By The Artful Soul, this is part of a dark green geometrics polymer clay collection, fir and forest with white and beige. Detailed handbuilt patterns are sliced and mounted onto background clay, accented with gold leaf, then fired. Light and artful. 1-1/4 inch triangles have surgical post 1/2 inch below top point, to be worn at angle shown. Earrings are 2-1/2 inches long on surgical earwire, 1 inch across. Necklace has 7 clay pieces curving across 6 inches of front, 1-1/4 inch tall at center, and suspended from beads that include zebra jasper, vintage Czech glass and seed beads. Goldfill chain in back, lobster clasp, 17 inches long. 1-1/4 inch pendant is suspended from double dark green satin cords, 17 inches long, spring ring clasp. 1-3/4 x 1-3/8 inch oval pin has horizontal barpin clasp to wear at angle shown. By The Artful Soul, this is part of a lime green geometrics polymer clay collection, bright lime, apple and kelly with white. Detailed handbuilt patterns are sliced and mounted onto background clay, accented with gold leaf, then fired. Light and artful. 1 x 7/8 inch earring has surgical post 5/16 inch below top edge. 1-3/4 x 1-1/4 inch pin has horizontal barpin clasp to wear at angle shown. By The Artful Soul, earrings in mixed media polymer clay and resin. 1-7/8 x 3/4 inches, surgical steel post. Made with based of light golden beige polymer, a sheen of silver powder on top makes it a pale pearly gold with embossed patterns, cavities filled in with pearlescent mint green resin. Two pieces are joined by golden rings. By The Artful Soul, this is part of a pastel sea green geometrics polymer clay collection, pastel mint and seafoam, hint of khaki. Detailed handbuilt patterns are sliced and mounted onto background clay, accented with silver leaf, then fired. Light and artful. 1-3/8 inch round earrings have surgical post 3/8 inch below top edge. Pendant measures 1-1/2 x 2-1/4 inches, tied onto ivory satin cord at 27 inches long (no clasp). Pin measures 1-1/4 x 1-5/8 inches, horizontal barpin clasp to be worn at angle shown. 1-1/2 x 1-1/4 inches, easy size to wear and light in weight, this pin has colorful beads arranged to depict the 3-leaf shamrock. Velveteen on the back.